FAQ: How do you hang plates on a wall? A: With regular plate hangers you can buy at home improvement stores or on Amazon. FAQ: And how do you hang them like that, how do you plan it out and measure the distances or do you use a template? A: Well….it’s all kind of random. Maybe. Let me explain. We recently repainted our dining room and while the walls are not in their final form (more details to come on the actual dining room plans after the holidays!) the room continues to evolve. Probably not surprising at all to anyone who has been reading the blog for awhile. We’ll talk more about the plans after Christmas. But in my usual holiday frenzy of decorating random things that have may appear to have nothing do with Christmas, I suddenly had the desire to rehang my white plates which had been sitting on the floor for awhile. It’s a pretty random act of plate hanging. You never know when the whim may strike. I loved how the plates were hung before (in my last random act of plate hanging) but spontaneous randomness is hard to repeat. And even if I could recreate it I usually just go with my whims, rather than repeating things exactly as they were before. Where is the fun in repeating exactly what you’ve done before? And so because this would make no sense at all, I grabbed a hammer and nails one evening right before we had guests over and without any measuring, thought or a plan I randomly hung my plates RIGHT AROUND my Christmas wreath. Not because I had always dreamed of a wreath and plate grouping, but because I wanted the plates on the wall NOW (as in, before dinner) and I didn’t want to move the wreath. I know, that’s lame and lazy. 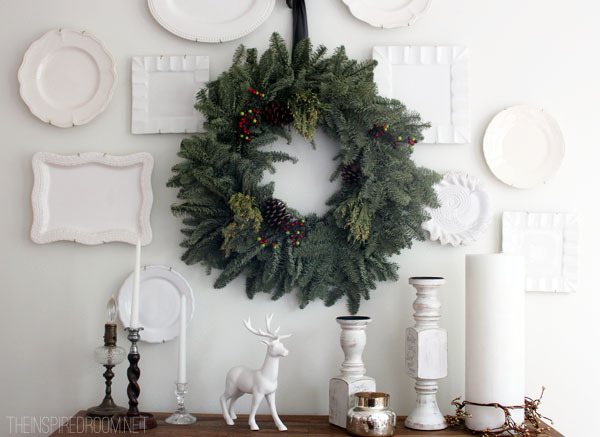 Why not take the wreath down first and create a template to get each plate hung perfectly? Because apparently that would require too much effort. And, I was in the middle of making dinner and had guests on their way over. So, I just picked up a plate, eyeballed a location for it, and up it went. No one was around to help me measure or decide what should go where, so I just did the best I could on my own. It took me maybe five minutes to finish. Is it perfect? No. I may add more plates to it later. But for now? It’s good enough. Yes, I realize there may be consequences to my impulsive and random plate hanging. There will for sure be an awkward wreath shaped VOID in the middle of the plates at some point when I take that wreath down. That’s weird. There will be new nail holes in the walls. I know my methods make normal people (who like to be exact with these kinds of things) twitch and break out into hives. My husband has to look away when he hears me hammering or he would hyperventilate. But it is how I roll. Especially with plate and gallery walls. Sometimes it is helpful to have a decorating plan, but so many times I just go with the flow at my house and decorate what I can when I am inspired on a whim. Which is usually around the holidays or right before guests are due to arrive. “Seize the whims” is a motto I live by. And, it’s just plates. Not brain surgery. No one would want me to do brain surgery. While my plates on the wall may not be there long term, maybe they will. My last random act of plate hanging stayed on the walls for years (but there was no wreath involved in that one.) I probably will remove or rehang the plates at some point anyway as the dining room is still evolving and I may not have the same furniture there as I do now. Maybe when I take my wreath down I will find just the right shaped dishes to hang in the gap where the wreath was. Or maybe I will find a spring wreath that could go there! Who knows? The possibilities are endless. I live life on the edge. But at least I got the plates on the wall in time for dinner that night. And in a round about way, I felt more ready for dinner that night AND for Christmas with my plates on the wall instead of the floor. *Update: I did end up filling in this wall with more white plates after removing the wreath! 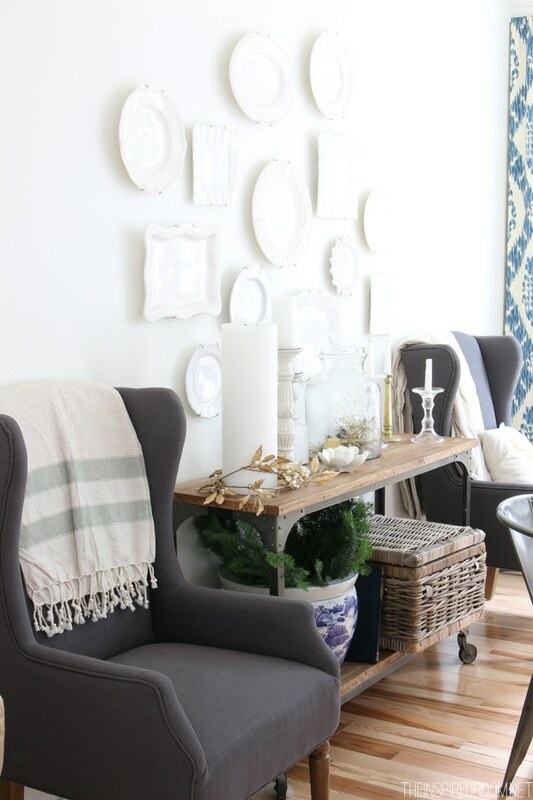 Here’s this same wall in my 2014 Christmas House Tour! “. . . spontaneous randomness is hard to repeat.” just cracks me up!!!! Oh, to do randomness as well, however. I loved this post! How good of you to just go for it, no measuring etc? I chuckled my way thru your musings, loving your motto :) Thanks for sharing, and you did a fantastic job with the plates. You’ve inspired me to “Seize the whims”! That is exactly how I hang every single thing in my home! Once I had to hang a pair of pictures in identical frames and it did not go well. I’m chuckling here because that is exactly how I roll, too! Hubby looking away and all! But your wall looks so good! Love it! Carpe whimsy? The wall is charming, and it would make me smile! Merry Christmas to your family! I was thinking perhaps a twiggy, natural wreath after Christmas! I do like your arrangement! you can hang plates at my house any day! I love this post. Random acts of plate hanging. Ha! That’s just beautiful! And … of course NOW … I totally and completely get it. 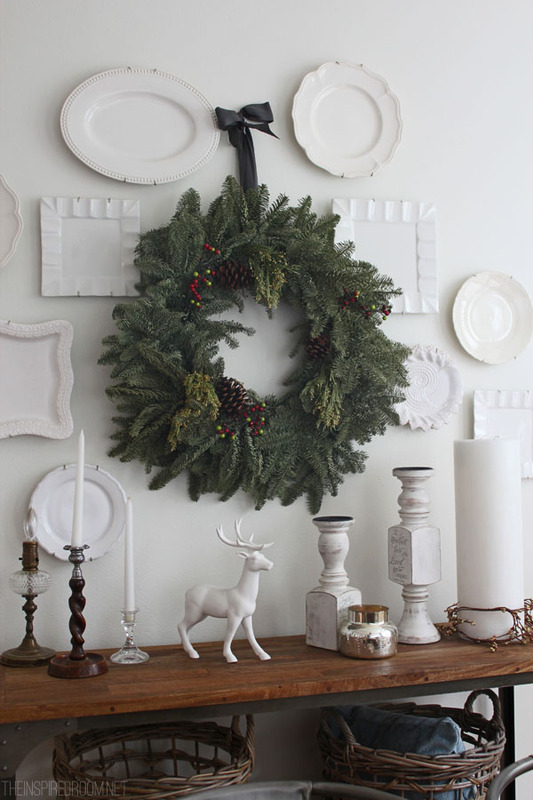 Love your plates on the wall WITH the wreathe. Love random. Our brains think alike! I am so happy to have name to how I do things…Seize the Whim and Hang…! For more than two years I’ve had to reign in my “hanging” because of leasing a home with cedar walls. We were asked to not put any holes in the wood…totally understand. But knowing we are going to be here at least another year I am going to go down to the store, buy me some of the removable hangers and Seize my Whim to Hang! Spontaneous…..that’s how I roll. I don’t think I have ever measured or planned when I hang things. It’s usually just an “eye-it” kind of thing. Your wall looks beautiful by the way. The wall is beautiful! Good for you for being random. You are an artist. Right brained people are creative and random. Go with your gut. I, too, am impulsive and creative. I embrace my impulsiveness. It is fun! Love this, Melissa! Pinned – great tips! I love how you were so spontaneous hanging the plates. They look so pretty with the wreath in the middle. Who knows what will happen next but I’m sure it will be just as pretty. 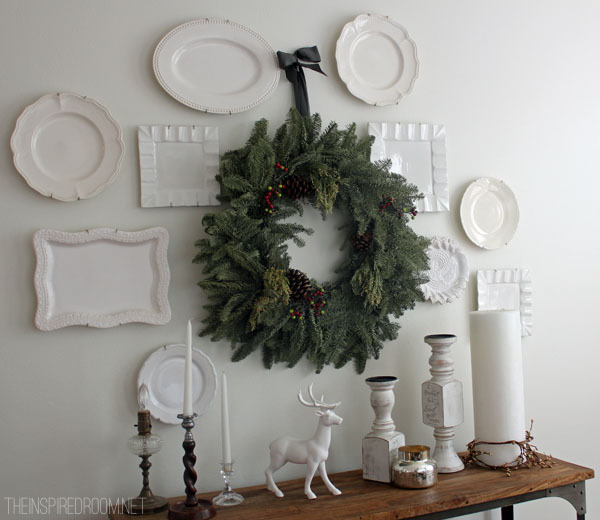 Your Christmas Wreath/Plate Wall looks beautiful Melissa! I love how spontaneous you are and find it quite inspiring! I too seem to have a burst of decorating energy right before guests arrive…sometimes that is the best time to get to that project that has been in the back of my mind…and sitting on my living room floor…for weeks. Happy Holidays to you and yours. The wreath looks lovely surrounded by the plates. Sounds like we think alike! I adore how the mood just strikes you and you pounce on it! I think you should start a random acts of hanging plate movement! Lol. I would love to do this in my dining room. I think I might raid the china cabinet tonight. Thank you for all of your inspirational ideas. Right there with ya, Sista! I like the randomness of the way you displayed this collection. Because they are all different shapes, it is a good way to celebrate that, to enjoy each one. I have a set my dear mother in law gave me which are all round and exactly the same size. It is hard to find a creative way to display them away from the traditional. This does give me some ideas though. I collect them over time when I see them, usually at places like Homegoods and TJ Maxx! Did you use White Dove for the white paint again? Can’t wait to see what your plans are!